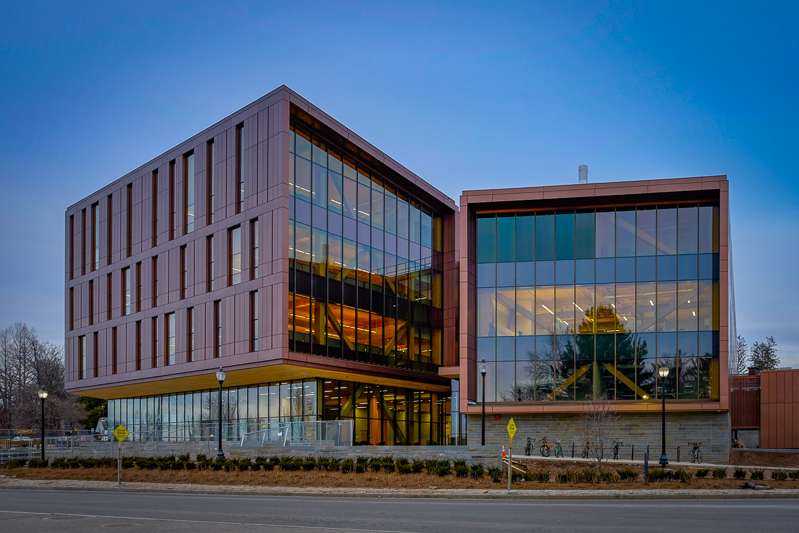 AMHERST — The new Design Building on the campus of the University of Massachusetts Amherst officially opened last week. Construction of the Design Building began in August 2015 and was completed in January, costing about $52 million in total. The building is located at 551 North Pleasant St., and is four stories tall. The Design Building will be home to the Building and Construction Technology program, the Department of Architecture and the Department of Landscape Architecture and Regional Planning, all of which were scattered around campus before the Design Building opened. The building’s reception ceremony was held Friday, where current and former students, faculty and local enthusiasts came together to celebrate and take tours of the building. The building has a “heavy timber” structure, an architectural concept that maximizes wood and minimizes concrete and metal. This concept was pioneered in part by research done at UMass by the Building and Construction Technology program. “Many students, many interns, they were integral parts of the program. I don’t know how we would’ve done it without them,” said Tom Chung, the building’s architect. The faculty offices are mixed by department, rank and title in order to try to encourage collaboration. The ground floor, a wide, spacious atmosphere has an indoor courtyard for the main area. Along the side of the courtyard are shop spaces and a display space transparent from the outside. Under the main stairwell is an auditorium space to host speaker events. The second floor, also with office space and studios, has computer labs that are primarily for students to work in freely — with the exception of classes that require the use of a computer lab. This floor has two lounge spaces overlooking the 1st floor courtyard, which are both already filled with students exchanging ideas and projects. The administrative office is on this floor, a friendly green space with timber beams coming through from the walls. On the third floor, on top of the studios and offices, there is also a pin-up space to further explore collaborative opportunities. This floor also has access to an outdoor courtyard, featuring plants installed by the Department of Landscape Architecture, where classes are held on warm days. The fourth floor features studios of mixed departments, collaboration spaces and offices for the faculty.